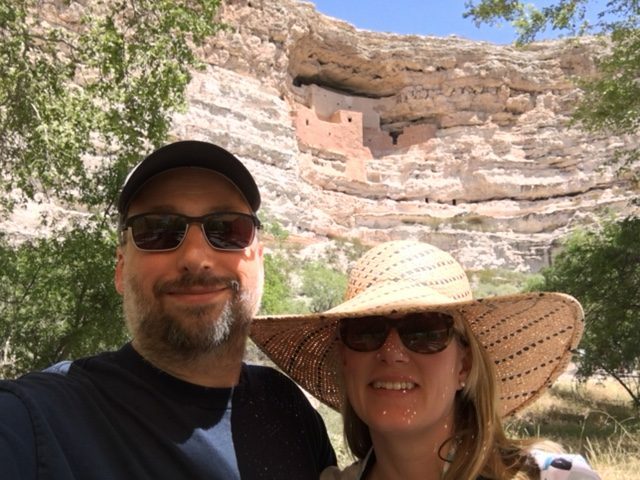 Montezuma’s Castle and Well – Live MoHo! 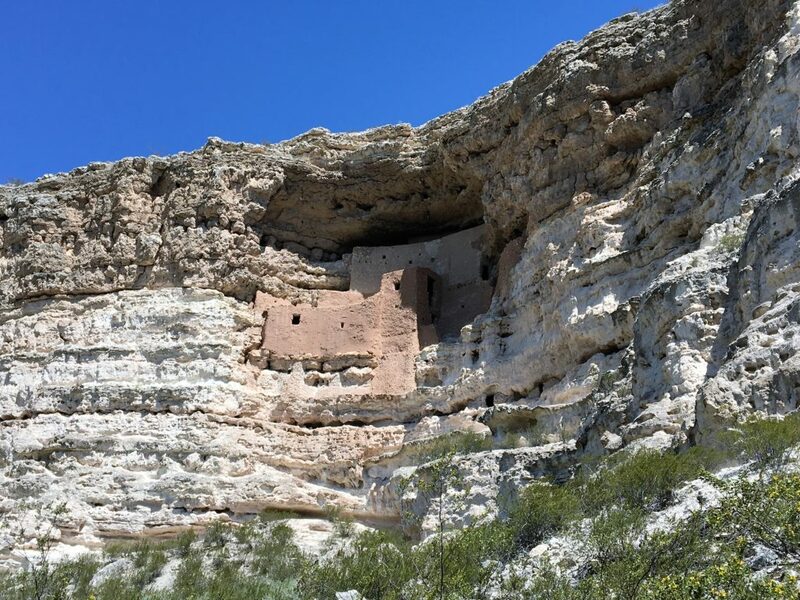 The somewhat oddly named “Montezuma’s Castle” is a spectacularly well-preserved cliff dwelling near Camp Verde Arizona. I say “oddly named” because it was built, used, and later abandoned before the Aztec emperor Montezuma was even born and it is unlikely he even knew of the Castle’s existence. Further, its not a castle in the European sense of a castle, but more like an apartment complex. See a later picture for the interior. Walking into the valley where the castle is located along the footpath from the visitor center is like stepping back in history. The Castle itself comes into view a few hundred yards from the visitor center. Montezuma’s Castle is a Federal Monument, signed into existence by Teddy Roosevelt (my favorite president, by the way). The Castle starts about 90′ up from the valley floor and was originally accessed by rope ladders. The inhabitants could withdraw the ladders making the castle very secure. 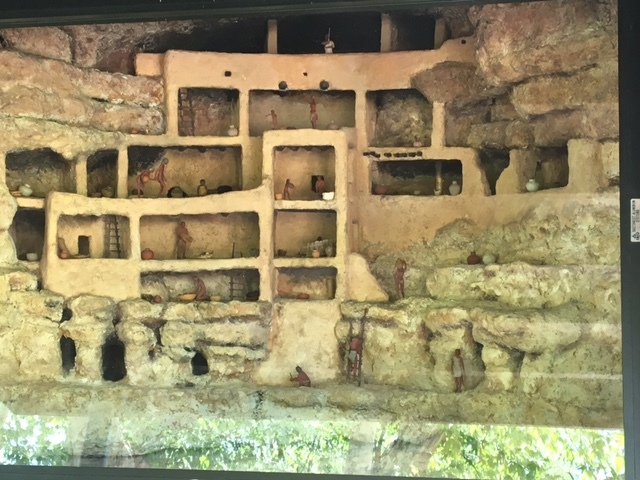 However, unlike the more well-known (and larger) Mesa Verde cliff dwelling, it is unlikely that the builders of Montezuma’s Castle were primarily interested in defense. The Castle lacks defensive design features that are present at Mesa Verde, including hidden escape tunnels and water storage, that would indicate the builders expected to withstand a siege. Instead, its likely that the Castle was built to both protect its inhabitants from the frequent flooding of Beaver Creek which runs through the valley floor and to take advantage of the environmental protection. The Castle is shielded from rain by the overhanding ledge above, and its southern exposure means it enjoys temperatures approximately 20 degrees warmer in the winter and 20 degrees cooler in the summer than the valley floor. The Castle is approximately 1000 years old! It has been expanded since it was created, but it was used for almost 400 years before it was abandoned in the 1400s. The Castle is over 4,000 square feet, 20 rooms (about half of which would have been used for living space), and 5 stories. The interior was closed to the public in 1953 but this model shows what the interior looks like. The Castle would have housed 35-50 people at its peak. Other than preservation – basically “re-mudding” the exterior, the castle is completely original. And the “re-mudding” is done to historical standards and uses mud from the valley floor. The dry climate and overhang preserve the Castle incredibly well! A larger site, known as “Castle A” existed a few hundred feet away from Montezuma’s Castle. 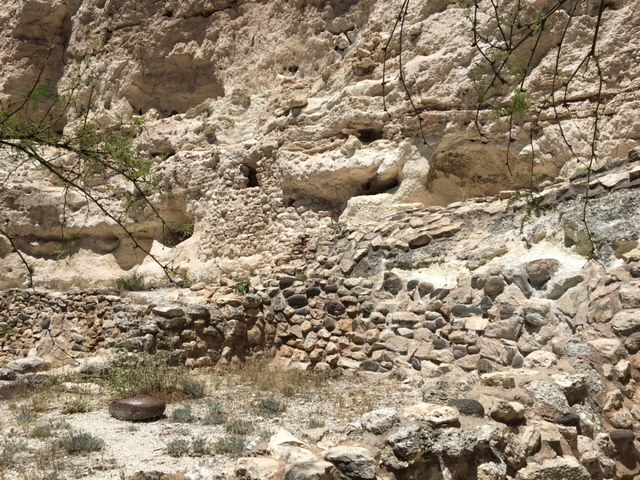 Castle A was considerably larger than Montezuma’s castle, with an estimated 60-70 rooms and a population of approximately 200 people. Castle A is mostly ruins now, but much of the foundation can still be seen. 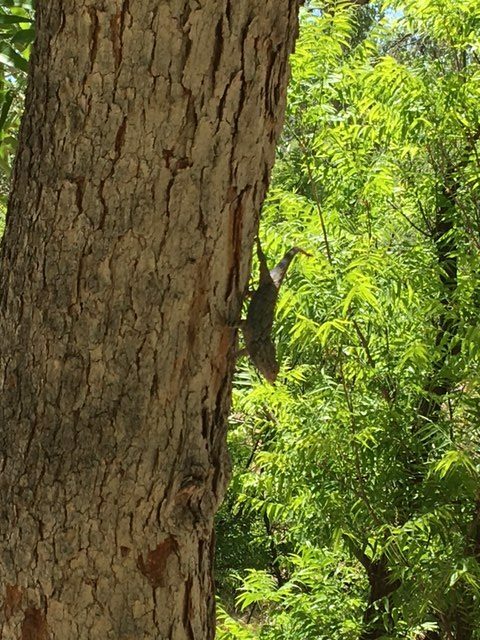 The valley floor is rich with life, including this little guy who was hanging on a tree watching the tourists go past. 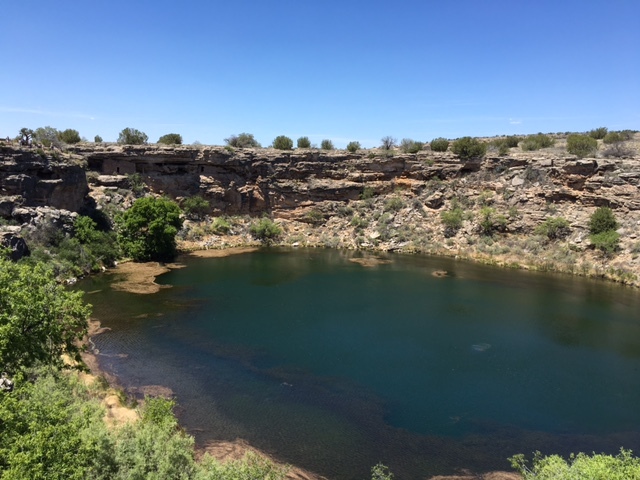 About 11 miles north of Montezuma’s Castle is an incredible oasis called – wait for it – Montezuma’s Well. The Well is a limestone sinkhole crater about 100 feet deep from which freshwater springs spill almost 1.5 million gallons of water a day. This water supply is steady regardless of drought and has been using for irrigation since at least 600 BCE. The water is highly carbonated – about 80 times more carbonation than typical groundwater – and as a result cannot support fish. It also has high levels of dissolved arsenic, which would have made the water unsafe for long-term human consumption. 5 species live here, including a freshwater leech and a type of freshwater shrimp that exists nowhere else in the world. 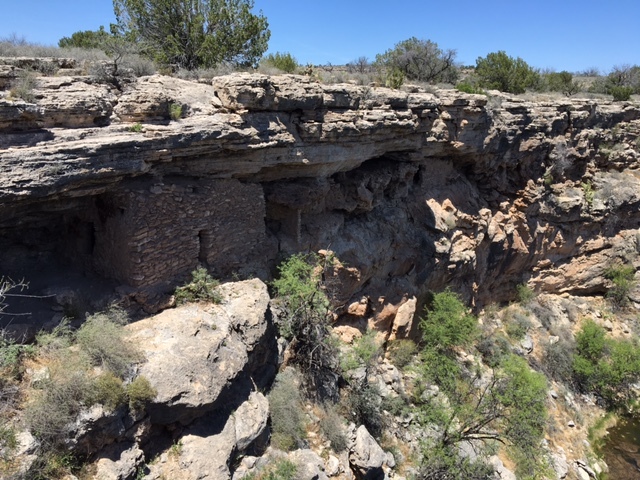 Cliff dwellings are evident just below the rim of the castle, and while much smaller than Montezuma’s Castle, they are built in the same style. No preservation has been done and they have lost their outer covering of mud leaving the rocks exposed. Early advertising or just graffiti? There are more structures at the bottom of the well in the limestone caves that allow the water to escape (that 1.5m gallons a day has to go somewhere). These structures turn open cave areas into rooms. The temperatures here would have been very steady year round, cool in the summer and warm in the winter. Unfortunately, there is graffiti in this area. 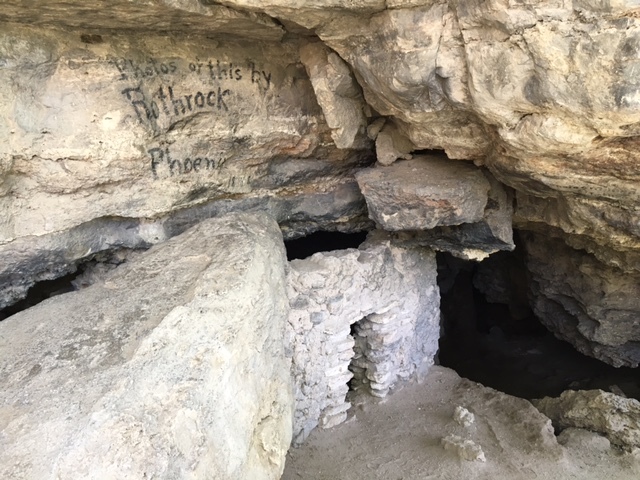 Rothrock photography marked this spot in 1899 with a graffiti/advertisement. There are other marks from the late 1890s but fortunately few “modern” defacements. To get to Montezuma’s Well, we passed through the little (little) town of McGuireville Arizona. 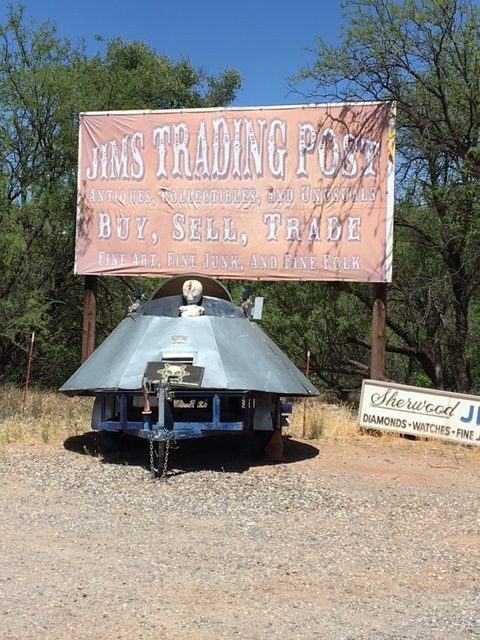 Its claim to fame is Jim’s Trading Post, a surprisingly interesting collection of both junk and genuine antiques. I couldn’t resist the alien spacecraft, complete with alien, parked out front. Its a trailer, and is for sale, if you are interested in towing in behind your MoHo.